Double vinyl LP pressing. 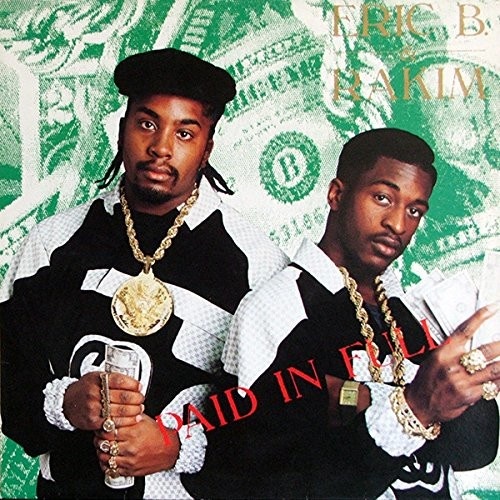 Paid in Full is the debut album from hip hop duo Eric B. & Rakim, originally released on July 7, 1987. Often credited as a benchmark album for the golden age hip hop, the album produced five singles: "Eric B. Is President", "I Ain't No Joke", "I Know You Got Soul", "Move the Crowd", and "Paid in Full", all of which set a higher standard of lyricism in the genre and served as a blueprint for future rappers and producers to come. Eric B. & Rakim formed in Long Island, New York, in 1986, composed of Eric B. (born Eric Barrier) and MC Rakim (born William Michael Griffin Jr.).